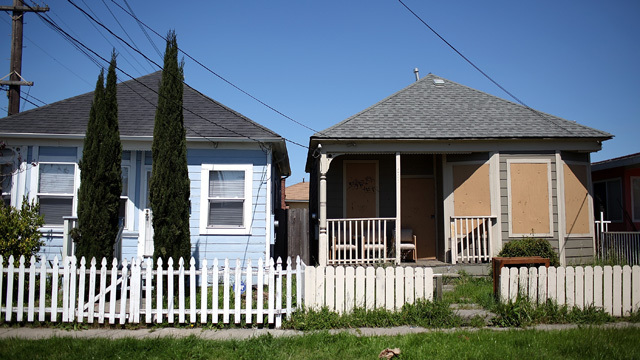 If Richmond goes ahead with its plan to buy "underwater" mortgages, it will be the first city to use eminent domain to address its housing crisis. About half of homeowners with mortgages in Richmond are underwater, some owing three to four times as much as they paid for their homes. City officials have already sent letters to homeowners offering to buy loans at a portion of their market value. For example, a home purchased for $400,000 but valued at $200,000 would have its loan bought for $160,000 by the city. Other cities, including Seattle and San Bernardino, have also considered the strategy, which is opposed by banker and realtor associations. We discuss the pros and cons of eminent domain, and what it would mean for Richmond residents.